Both moose and deer were constructed by studio founder, Beau Cameron, who is one of the rare geniuses in the computer graphics industry. Provided he had enough time, Beau could perform, by himself, literally every technical feat involved in the creation of the digital creatures. He designed, modeled, rigged, and furred the beasts, then supervised the VFX shot creation. Beau's two right hand men, Anthony Bussiere and David Sliviak, handled the texture mapping, lighting, rendering, and compositing. All commercials were directed by Steve "Spaz" Williams, a former Jurassic Park animator who, with little or no interference, trusted our team to create all of the creature effects by ourselves. Steve possessed a rare quality in an industry director in that he gave us a lot of much appreciated latitude on the project. For me, it was an absolute pleasure to animate the characters in these commercials. Character performance was somewhat constrained due to the limitation of animal heads without bodies; however, at the same time, that restriction speeded up the whole animation process tremendously. 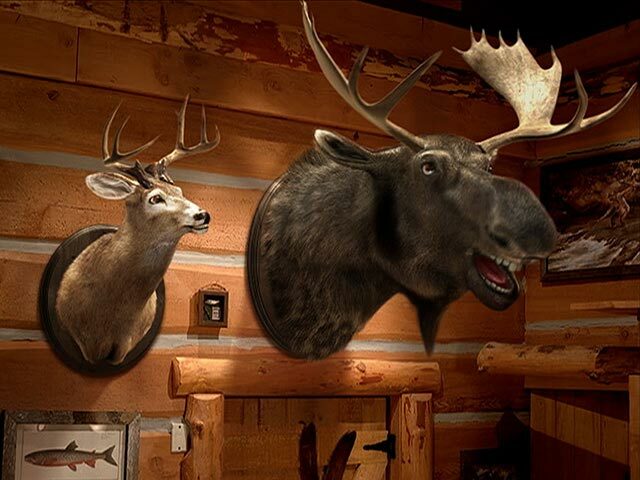 In the first commercial, Steve requested very restrained character performance because the moose and deer heads were not supposed to be noticeable by the customers in the restaurant. In the subsequent commercials, that restriction was lifted and the animals became much more lively. Fortunately, our voice talent's performance was very good and that helped to give me ideas for certain character quirks. The deer was the funny, wacky, neurotic one who was depicted by snappy movement, while the moose was essentially the straight man who moved in a slower, more deliberate fashion due to his greater mass. Both the director and the client must have been pleased with the character portrayal because virtually every shot I animated was fully approved without any requests for revisions. Due to that successful venture, my nickname soon became "Onetime" at the Beau Studio! The creature effects for the Montana's Cookhouse commercials were created quickly and efficiently within a very reasonable budget. This demonstrates just how much can be accomplished by using only a four-man team! Moose and Deer are trademarks of Montana's Cookhouse.